A Trump appointee told the head of the diversity office at the Department of Veterans Affairs to please tone down her condemnation of the 2017 "Unite the Right" rally and the killing of Heather Heyer by one of the white supremacists, the Washington Post reports. 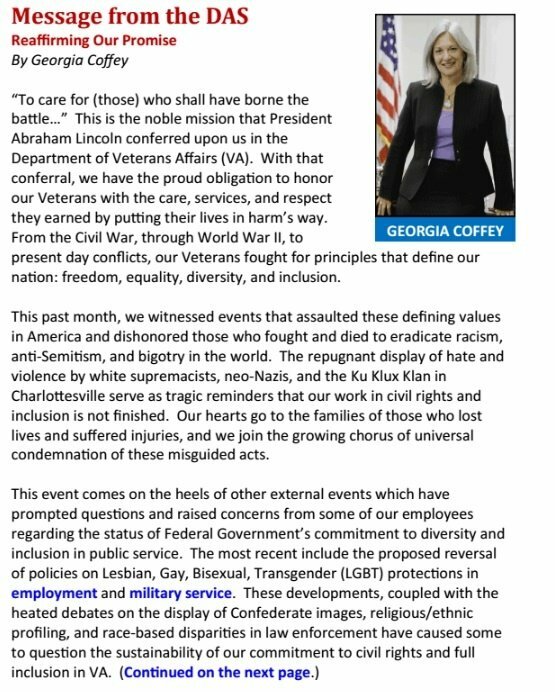 Georgia Coffey, then the VA's deputy assistant secretary for diversity and inclusion, drafted a statement condemning the "repugnant display of hate and bigotry by white supremacists, neo-Nazis, and the Ku Klux Klan." Coffey emailed it to the agency's public affairs office, asking that it be distributed within the department and to the public. Instead, she was told to stop making such a fuss in an email by VA comms head John Ullyot, according to emails obtained under a FOIA request by nonprofit watchdog group American Oversight. Ullyot made it clear to Coffey that government officials shouldn't be contradicting the "president's" insistence that the violence in Charlottesville was the fault of bad people "on many sides -- on many sides." As we all know, the White House was trying to keep official messaging in line with Trump's own wackadoodle opinions, because after all, anti-fascists are just as bad as fascists, aren't they? So some people just needed to understand that a mere outbreak of racist violence is no reason to condemn violent racists too loudly, as WaPo's examination of the emails explains. A statement from VA leaders was necessary, Coffey wrote in one email to Ullyot, because the agency's workforce was unsettled by the uproar caused by the Charlottesville violence. Minorities make up more than 40 percent of VA's 380,000 employees, the federal government's second-largest agency. Ullyot told Coffey to stand down, the emails show. A person familiar with their dispute, who spoke on the condition of anonymity, told The Post that Ullyot was enforcing a directive from the White House, where officials were scrambling to contain the fallout from Trump's comments, and they did not want government officials to call further attention to the controversy. Directive from the White House? No such thing, and why is the lying media just making sources up again, huh? VA spokesman Curt Cashour said the agency received no such guidance from the White House. my personal opinions as an American and as a Jewish American. . . . And for me in particular, I think in learning history, that we know that staying silent on these issues is simply not acceptable. John Ullyot does not want to post the message, as the Secretary previously made statements in the news media on this topic earlier this week. Coffey urged expediency, telling Ullyot that she had sent the statement to Shulkin and his chief of staff for their review, according to their email exchange. So pretty clear then! Everybody say your piece! The secretary says so! But maybe not. Ullyot wanted to remove the statement's more incendiary language but told Coffey she could keep the part that reminded employees of VA's "strong commitment" to equal employment opportunity and diversity, their emails show. Asked about that, Shulkin -- who was shitcanned in April -- told WaPo he didn't recall his conversation with Ullyout, but said he'd been "pretty public about my opinions on the Charlottesville events . . . and of course I think all Americans should express their views" (or at least he's able to say that now). Coffey didn't want to tone down her full condemnation of Nazis and racists, because what part of "diversity" didn't the Trump people understand? (All of it, Katie.) She offered to take Shulkin's name out, but no, Ullyot told her the statement was not to be used at all. "Universal condemnation of these misguided acts"? Worries about reversals of policies on LGBT rights and fretting over the beautiful historical reminders of the Great Americans who made war against the United States? You just hold on with all your crazy lefty radicalism, lady! Coffey was read the riot act and given a reprimand in her Permanent Record. The VA disappeared that issue of the newsletter from its website, without issuing any notice or explanation of the deletion, which isn't illegal but goes against "best transparency practice" for government agencies, according to POGO, which we hope would agree we have met the enemy and he is us. Shortly after the foofaraw last year, Coffey resigned from Veterans Affairs and eventually took a job with Lockheed Martin as senior manager for diversity and inclusion, and no she did not care to speak to WaPo about any of it, thanks. WaPo reports the VA is still very touchy about saying too much about Charlottesville. Current VA secretary Robert Wilkie issued the most non-commenty comment possible, simply confirming that . John Ullyot is on the VA team because he is committed to veterans and has spent a lifetime of exceptional service as a Marine and public servant. Shulkin had "dictated explicitly to John how he wanted this particular issue handled." The secretary, Cashour said, was "adamant that VA employees keep their personal views on the Charlottesville issue out of official VA communications, as Shulkin had done himself in public comments two days beforehand. John was simply ensuring that Coffey understood and followed Shulkin's guidance." Jeeze, why don't people understand the head of the diversity office shouldn't muddy the waters by suggesting racist killings are bad? Shhh, hush now, let's just leave this one alone, OK? To get the final word on whether racism is bad, we suppose we'll have to ask Spider-Man's boss, if he ever comes out of Mar-a-Lago. Yr Wonkette is supported by reader donations. Send us money and maybe we'll show you OUR secret embarrassing emails. Or not.